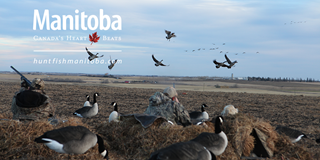 With a diverse landscape that attracts massive flocks of ducks and geese each fall, Manitoba offers a unique waterfowl hunting experience for everyone. And while a trip to this province can deservedly be considered one of a lifetime, here is a look at three hunts that will have you eager to come back for more. If a remote, unique waterfowl hunting destination is calling your name, then look no further than a trip to the coast of Hudson Bay, where visitors are treated to tremendous multi-species hunts in a setting unlike anywhere else. Snow, Ross’s, lesser and greater Canada geese, mallards, pintails, black ducks, and more are found in this region, says Randy Duvell, who hosts small groups of hunters at his Kaska Goose Lodge near the mouth of the Kaskattama River for three weeks each September. Hunting is done from natural blinds, where guests wait in anticipation for decoying flocks of waterfowl near the top of the flyway. Wildlife doesn’t just fill the sky, however. Hunters can also chase willow ptarmigan in the Hudson Bay lowlands or simply soak in the scenery of the Hudson Bay coast. Home to some of the first fields of harvested barley, wheat, oats, and corn that migrating waterfowl encounter on their way south through the province, Manitoba’s Parkland region is a hub for both ducks and geese in the fall. And while the gunning for mallards and other puddle ducks is second-to-none, it’s the Canada goose hunting that hunters should experience at least once in their lifetime. The sheer number of waterfowl that visit the region make it worth a trip, but the natural features of the Parkland region – its forests of conifers bordered by stands of aspen and lakes of clear water – create a unique backdrop for hunters peering from their blinds at flocks of decoying Canada geese. 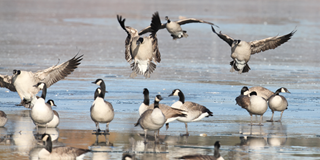 “This region of the province is an absolute mecca for waterfowl, but especially for Canada geese,” Liske says. 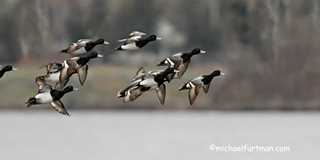 Manitoba’s Delta Marsh has a well-earned reputation as a top destination for diving ducks, but hunters interested in experiencing tremendous flights of canvasbacks, redheads, bluebills, and ringnecks shouldn’t ignore the lakes and marshes found in the northern portion of the province. Canvasbacks, in particular, are a favorite target of hunters who visit the Evergreen Resort near The Pas, says lodge owner Ken Kobelka, with hunters commonly filling half their daily bag limit with the iconic diving duck. Variety is the spice of life for diver duck hunters near The Pas, Kobelka says, as opportunities to hunt a variety of species in a variety of settings are the rule rather than the exception.